Southwest power plant is supplying power for 140,000 homes, but singeing so much fauna in the process. The biggest adversary renewable energy typically faces is efficiency (or blue bloods who don't want beach views ruined), but this latest clean energy snafu comes at the cost of thousands of our winged friends. Ivanpah is the largest solar thermal power plant in the world. 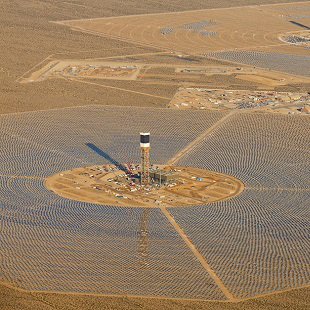 Located in the Mojave Desert in Southern California, the plant uses 300,000 mirrors to focus sunlight onto one of three central towers, and the heat is converted into energy via special steam turbines. The facility provides electricity to roughly 140,000 homes in California and Nevada. The plant is relatively new, having opened earlier this year, but a previously-known issue is now attracting attention from the federal government. Because the mirrors focus light onto a single high point, the heat within the mirror field perimeter is deadly -- up to 1,000 degrees Fahrenheit -- particularly to local feathered friends. While BrightSource Energy, the operator of the plant, says roughly 1,000 birds could die every year by flying above the mirrors, the Center for Biological Diversity says that annual figure is closer to 28,000. The estimated figure has now drawn the attention of the feds, specifically the US Fish and Wildlife Service. The FWS wants a more accurate count on wildlife deaths associated with the plant (1,000 and 28,000 are pretty far apart, right? ), and hopefully a solution to help stem the singed bird tide. Even if BrightSource gets a handle on the flaming fowl issue, the threat to airline pilots may never go away.